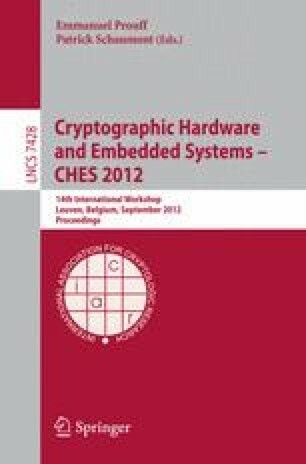 Side-channel attacks have proven many hardware implementations of cryptographic algorithms to be vulnerable. A recently proposed masking method, based on secret sharing and multi-party computation methods, introduces a set of sufficient requirements for implementations to be provably resistant against first-order DPA with minimal assumptions on the hardware. The original paper doesn’t describe how to construct the Boolean functions that are to be used in the implementation. In this paper, we derive the functions for all invertible 3 ×3, 4 ×4 S-boxes and the 6 ×4 DES S-boxes. Our methods and observations can also be used to accelerate the search for sharings of larger (e.g. 8 ×8) S-boxes. Finally, we investigate the cost of such protection. This work was supported in part by the Research Council KU Leuven: GOA TENSE (GOA/11/007) and by the European Commission under contracts ICT-2007-216646 (ECRYPT II). V. Nikov was supported by the European Commission (FP7) within the Tamper Resistant Sensor Node (TAMPRES) project with contract number 258754 and the Internet of Things - Architecture (IoT-A) project with contract number 257521.